10 Desk Hacks to Improve Your Thinking and Alertness At Work #Infographic ~ Visualistan '+g+"
In the digital age, we’re increasingly bombarded with new technology and devices that demand our attention. In an office environment, it can be difficult to stay focused with so many screens and applications to keep track of. Thankfully, there are some office gadgets that can consolidate some of this technology to increase your productivity. From dry erase desks to cable management boxes, there are lots of options that offer a big return on productivity for a little investment. With the right office gadgets, you won’t have to open multiple applications to take notes, or spend ten minutes untangling wires underneath your desk. Thanks to modern technology, even USB cup warmers are available to keep coffee hot and productivity at its best. There are a lot of productivity boosters out there, but don’t worry if you don’t know where to start. We’ve got you covered. 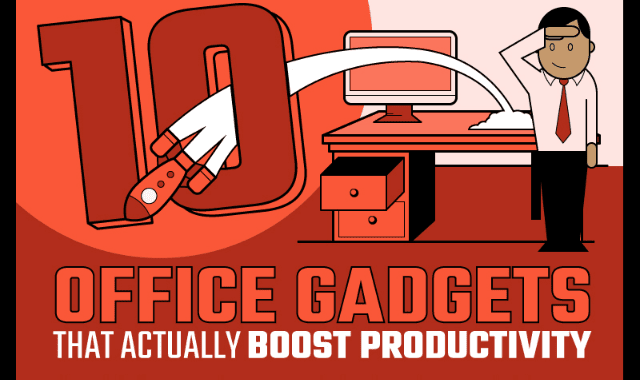 Take a look at this infographic designed by 10Machines.com to discover 10 office gadgets that actually boost productivity. We hope these tips help you maximize your productivity!